personal trials, he advanced poetry beyond the Petrarchin model of love won and lost to write of personal despair, history, politics, war, religion, and the natural beauty of Portugal. The first significant English translation of Camoes's sonnets in more than one hundred years, "Selected Sonnets: A Bilingual Edition collects seventy of Camoes's best--all musically rendered into contemporary, yet metrical and rhymed, English-language poetry by William Baer, with the original Portuguese on facing pages--and reintroduces the genius of a poet whom Cervantes called "the incomparable treasure of Lusus." 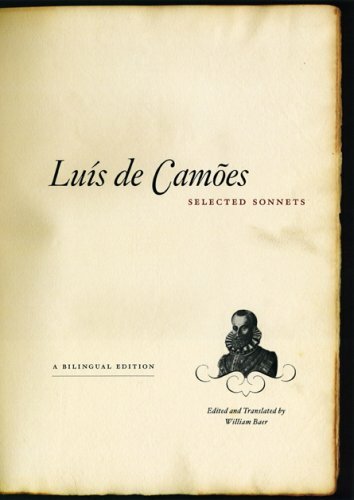 A comprehensive selection of sonnets that demonstrates the full range of Camoes's interests and invention, "Selected Sonnets will prove indespensible for both students and teachers in comparative and Renaissance literature, Portuguese and Spanish history, and the art of literary translation. be, in addition to an epic poet, an intensely lyric poet as well. "Que levas, cruel Morte?" "Um claro dia"